Determined to save the realm of the Dragon King, a mortally wounded knight makes a desperate plea for someone to continue his quest. Penned by an internationally acclaimed fantasy author, with more than 2,000,000 copies in print, this series is a modern classic. 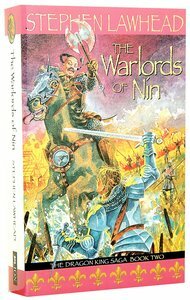 About "The Warlords of Nin (#02 in Dragon King Trilogy Series)"
Each night the Wolf Star looms larger and larger as the power of Nin the Destroyer increases, spreading black terror. Rescue lies in the legendary sword of Zhalighkeer, the Shining One. Chosen by fate, Quentin once again holds life and death in his hands. The Dragon King Saga follows the fortunes of Quentin, a young temple assistant. In this volume Quentin once again holds the kingdom's destiny in his hands. This book is aimed at a new generation of readers aged 11+. Stephen R. Lawhead is an internationally acclaimed author of mythic history and imaginative fiction. His works include "Byzantium" and the series The Pendragon Cycle, The Celtic Crusades, and The Song of Albion. Lawhead makes his home in Austria with his wife.